If you’re a fan of the Official PInow Facebook Fanpage you’ve likely been following our latest competition, PI March Madness. The competition pitted private investigators of lore against each other in the most talked about investigator matchup of the century. Television greats, legendary novel characters and even some animated cartoons and superheroes faced off in the competition, and some of the investigators revealed how these fictional characters inspired them to start their careers. 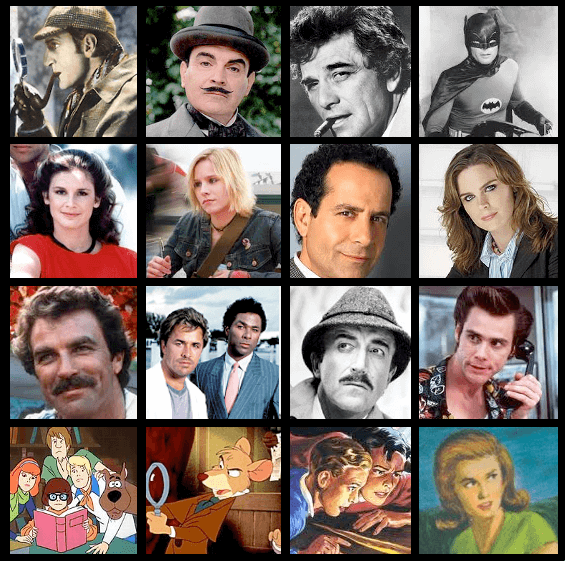 The contenders (from left to right): Sherlock Holmes, Hercule Poirot, Columbo, Batman, Remington Steele, Veronica Mars, Adrian Monk, Bones, Thomas Magnum, Crockett & Tubbs, Inspector Clouseau, Ace Ventura, Scooby Gang, The Great Mouse Detective, The Hardy Boys, Nancy Drew. With the Sweet Sixteen selected, some private investigators wondered where their favorites were. “Where’s Psych?” investigator Scott Reaves asked, while Mission Possible Investigations inquired about the absence of Rockford and Moonlighting’s David Addison (we’re not sure Bruce Willis’s character would qualify--Willis was a private investigator before he became an actor). Other noted omissions included Darke Detective, Spenser and Mike Hammer, but none advanced to the Sweet Sixteen. If the lamenting revealed anything it’s that next year’s competition will be a fierce one. Investigators laid down their loyalties early on in the competition. “If Sherlock Holmes doesn’t win the whole thing I will stop being a P.I. and become a baker!” Investigator Scott Fulmer declared before the bracket was even released. No word yet on whether or not Fulmer has permanently retired his apron and rolling pins. Other investigators agreed. “Got to be Sherlock,” Michael Wells said, “The greatest thing to bring awareness of the Private Investigation world!” EPIC Investigations & Consulting agreed, saying, “Holmes is the most famous for a reason!” Mission Possible Investigations delivered somewhat of an omen, saying, “The way the bracket is set up it should boil down to Sherlock Holmes vs. Thomas Magnum.” The New York-based investigations firm examined, “Batman may have the best technology for surveillance but if this is a battle of the minds Sherlock Holmes wins! Hands down.” As the competition kicked off it was clear other fans felt the same. Holmes, the number 1 seed in the competition, progressed from the Sweet Sixteen in an early victory against Hercule Poirot. Voted out by a loss of 12-3, Agathe Christie’s most notable character couldn’t trump Sir Arthur Conan Doyle’s iconic creation. Holmes advance to the Elite Eight to face off against Columbo. Columbo released his inner villain to beat out Batman by a 7 vote margin in the first round, but it looked like he was ready to light up the bat signal for help as Holmes trumped him in a 9-1 victory to progress to the final four. Up against Holmes in the semi-final was Adrian Monk. Monk was off to an obsessively clean start in the first round, passing Dr. Temperance “Bones” Brennan in an 8-3 lead. In the midst of an Elite Eight battle with Veronica Mars, Monk narrowly defeated the high school sleuth after she slid into the second round with a one point victory over Remington Steele. Though Monk started the competition off strong, he couldn’t keep up the momentum, and warranted a measly 1 vote in the semi-final against the deerstalker wearing detective’s 7. Thomas Magnum, a clear crowd-favorite from the start, drew Crockett & Tubbs in the first round. It wasn’t much of a match, and Crockett & Tubbs proved they had more than one vice when they were skunked out of the competition in a 6-0 loss. Magnum progressed to the Elite Eight and a match against Inspector Clouseau. Reaching a narrow first-round victory of 5-4, Clouseau proved that when it comes to erratic behavior a mild case of denseness can always beat-out a fashion sense that consists of Hawaiian shirts and an exaggerated hairstyle. Clouseau bowed out of the competition in a 3-8 loss in the second round against Magnum, who advanced to a semi-final round against youth-novel maven Nancy Drew. Drew entered the competition against The Hardy Boys in possibly the most evenly-matched batte of the competition. In a one-point victory, Drew conquered the boys only to face another group of adored investigators against the Scooby Gang. Initially matched against The Great Mouse Detective, the great dane proved that the magnifying glass-sporting rodent just wasn’t great enough, and Scooby and his cohorts advanced in a 5-1 victory. But Nancy Drew defeated her second group of the competition and the canine uttered “Ruh Roh, Raggy” as Drew slid into the Final Four with a 4-3 win. Though she showed promise early on, Drew couldn’t hang with the big boys of the competition, and Magnum’s 5-1 victory solidified his spot in the finals. As predicted by many investigators, Magnum fell to Holmes in the final round of the competition. But Magnum didn’t walk away empty-handed. As a clear fan favorite, this PI would have easily snagged a Mister Congeniality Award. Fans declared the Oahu-based private eye as having the most exotic locale, and in early matchups investigator Philip Johnson cast his vote saying it was an, “Easy [choice] for us Hawaiian shirts.” In a separate mini-match, Magnum was unanimously awarded the title for “Best Private Investigator Mustache”, reaching 9 votes to Clouseau and Poirot’s goose eggs. With second place and a killer mustache, we’re sure Thomas Magnum will remain a fan favorite, especially with the ladies. Participants made it clear that investigators both fictional and non-fictional inspired them to pursue the career. In several Famous PI Spotlights, investigators offered their input on how the fathers of private investigation shaped their careers. Industry legend Jay J. Armes lost both hands at age thirteen and after a brief stint as an actor started his own private investigation agency. “I read his autobiography in 1973,” Scott Fulmer said, “It’s one of the reasons I got into this business.” Armes is the only non-fictional private investigator to ever be made into an action figure. Werner Mauss, an investigator who works exclusively as a civilian employee for police authorities and intelligence services, has been associated with many criminal cases. “If only we could all look so well and have such an aura when we are his age,” EPIC Investigations & Consulting proclaimed of the 72 year old investigator’s legendary aura. Former crook Francois Vidocq is known as the first private detective and the father of modern criminology. Vidocq’s life story inspired writers like Victor Hugo, Edgar Allen Poe, and Sir Arthur Conan Doyle. One fan begins with Vidocq in a licensing course he teaches, while another investigator said remarked that there was once a company in Houston named after him. The fun was also peppered with trivia and fun facts. Private investigator Allan Pinkerton, credited as America’s first private eye, saved President Abraham Lincoln from assassination en route to inauguration and was asked to create The Secret Service as a result. Hercule Poirot received an obitiuary in the New York Times, the only fictional character to have one, on August 6th, 1975. It chronicled Poirot’s life as lived in the novels of Dame Agathe Christie--she admitted he would have been over 130. Though you may have spent the last month watching basketball, it’s clear that PI March Madness is where the fun really was. In a lighthearted competition many investigators found themselves sharing inspirational stories and learning fun facts about some of fiction’s greatest private eyes. There’s always something happening on the Official PInow Facebook Fanpage, so make sure you like us to join in on the fun!